Writer Mark Waid and artist Fiona Staples are working a special kind of magic with Archie #1. They’ve managed to create something that’s fresh and surprising without sacrificing any of the things that make the best Archie stories so much fun. The two of them just plain get it, and the result is a flawless re-launch that will delight longtime readers and intrigue newcomers. It wouldn’t be an Archie story without some boy-girl trouble, and issue #1 finds Betty and Archie, Riverdale High’s cutest and most enduring couple, on the outs. The breakup is blamed on a mysterious “lipstick incident” that has all the kids talking, and plans are afoot to get the two of them back together at the homecoming dance. You’ll find yourself rooting for their scheme to work. Waid has the players down pat. In just a few beats, he establishes Archie as a relatable, endearing narrator, and he captures Betty perfectly with the statement: “She smells like flowers and motor oil.” Even if you had no frame of reference for Reggie or Jughead, you’d know immediately what roles they play in this universe thanks to Waid’s expert character sketches. And speaking of character sketches, Staples’ illustrations are as superb as you’d expect. 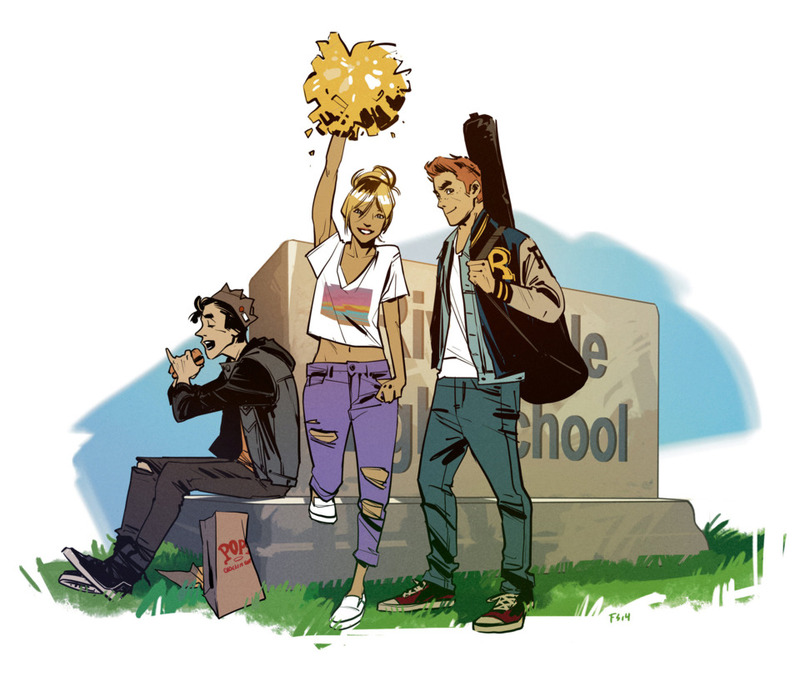 Everything about her take on Archie and his friends feels right. It references just enough of the past while bringing them fully into a new era. This issue is full of standout moments, like the scene of Betty practically recoiling at Reggie’s touch and Archie finding himself, guitar in hand, in a literal spotlight. Even if you’re only casually interested, Archie #1 is well worth your time. I can’t wait to see how Waid and Staples introduce one character who was conspicuously absent in this issue, but is sure to change the climate in Riverdale upon arrival. The new Archie Andrews is SO CUTE. I’ve been very pleased by all the things Archie Comics has done over the last few years. Some of the best stuff in my pull list is coming from them. I got a copy and I have to say that I LOVED IT! So sad that Archie and Betty have broken up and no one really knows why, but soon the triangle will be in full force because Veronica Lodge is coming to Riverdale. I wonder if Betty and Veronica will be friends or will they be frenemies? I love the art and I am going to be getting this new version of Archie monthly!